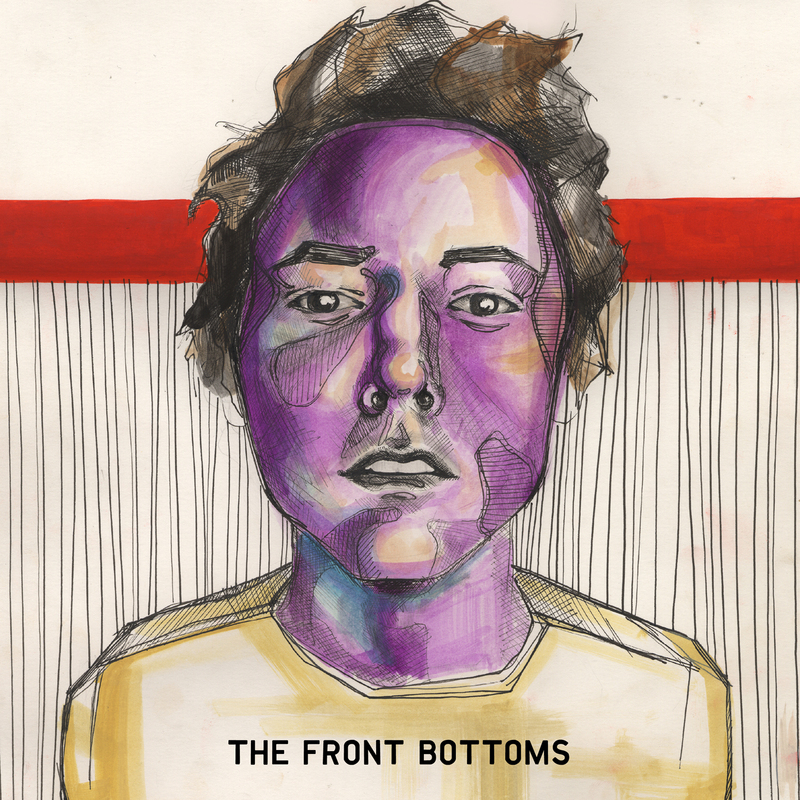 The Front Bottoms' self titled debut album is introduced with the line "please fall asleep so I can take pictures of you and hang them in my room, so when I wake up I feel like everything's alright". In a way, this line is in no way a bad way at all to introduce The Front Bottoms as a band. The band's lyrics often seem to follow the story of a stalker helplessly in love with his high school flame who consistently ignores him and upholds restraining orders. Throughout the album, the band maintains a rather comical atmosphere, balanced between the often ridiculously blunt lyrics that make murdering your own father seem humorous, Brian Sella's nasally voice that sounds halfway between John Darnielle and Jeff Mangum, and the recurring string section and piano that sounds like the band made no effort whatsoever to cover up the fact that it was done on an old Yamaha keyboard for beginner piano players. But despite all of the laughs that the quirky indie-pop duo might produce, the emotional response from this album is nothing less than overwhelming. Aside from the songwriting, the music is in no way any more sophisticated than you could expect from an acoustic guitar player and a drummer. The opener, "Flashlight", has the same fast paced bass-high hat-snare-high hat that you would hear in every single Two Door Cinema Club song released, underneath raw guitar chords and a distressed Brian Sella's simple but often brilliant lyrics. Mathew Uychich's energetic and powerful drumming drives the song and sets the stage for what of the rest of the album will be: a collection of catchy cathartic pop songs. Which stays true on the second track on the album, and probably the band's most well known song, "Maps". Although not being in anyway lo-fi, the low production value of the song is quite evident. The keyboard-filtered strings sick out like a sore thumb. But no matter how many things could be found on the album that would seem like it would bog down the music's quality, the music still stays consistently excellent, and there is no song on this record that I feel isn't as good as the previous one. What makes The Front Bottoms so entertaining yet still emotionally striking is their way of using trivial but unfortunate situations as metaphors for things such as family issues and failed relationships, which is portrayed well in the track "Bathtub". The song compares sitting in the shower, scrubbing away at your hair with soap without shampoo, tormented by the dry and dirty feeling that the soap leaves behind, yet still trying to convince yourself that you are "coming clean", which could be a situation that anybody could relate to, trying to solve a problem with something that does not help at all, yet trying to convince yourself that everything is alright and your hair is fine. There is not a single track on this album that I can listen to without feeling what Sella was feeling when he wrote the songs. I have listened to "Flashlight" countless times, and every single time the last verse comes along with the horn section (an authentic sounding horn section, I might add) and the vocal interplay between the track's verses , I am simply blown away. When a small band, especially from your area, like this makes an album so great, it's so much easier to appreciate. And there's nothing left to do afterwards but wait for them to blow up.